VALENTINE'S DAY MASSACRE Feb 8-9-10 is Fright Haven's special Holiday event. 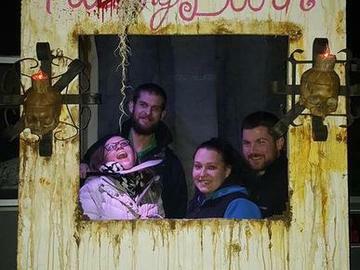 FRIGHT HAVEN is CT's Largest Scariest & Greatest INDOOR Haunted House. Three great attractions all under one roof - 20,000 square ft of indoor scares & screams at 411 Barnum Avenue Cutoff in Stratford, CT. Free parking and completely renovated with new scenes and events. "Love is patient, love is kind…love will drive you out of your mind." In this date night to die for, Cupid is tearing out his wings and taking deadly aim with his arrow. He’s had enough of matchmaking, and is ready to wreak havoc on all the thankless hearts of the world. This Valentine’s Day, there won’t be chocolates and candy hearts; there will be blood. Treat your (in)significant other to a date night to die for at Fright Haven’s Valentine’s Day Massacre. Connecticut’s largest indoor haunted house is back again to bring you ALL NEW attractions with ALL NEW scares. Take a peek into the ultimate date night gone wrong, and learn where lovesick souls go when the heartbreak drives them mad. The Tunnel of Love runs red with blood, a romantic candlelit dinner goes up in flames, and the teddy bears won’t be so cute and cuddly. Bloodthirsty lovers scorned and relentless admirers wait around every twist and turn in this horrifying take on the sweetest holiday. This special two-night-only event will change the way you think about Valentine’s Day forever…that is, if you escape the rampaging Cupid and make it out with hearts intact. Q: What is A Valentine's Day Massacre?
. Valentine's Day Massacre is Fright Haven's unique take on Valetines Day, crafted specially for those who just aren't ready to say goodbye to the Halloween season! A Valentine's Day Massacre at Fright Haven will feature all brand new themed haunted attractions. Take a peek into the ultimate date night gone wrong, and learn where lovesick souls go when the heartbreak drives them mad. The Tunnel of Love runs red with blood, a romantic candlelit dinner goes up in flames, and the teddy bears won't be so cute and cuddly. Bloodthirsty lovers scorned and relentless admirers wait around every twist and turn in this horrifying take on the sweetest holiday. This special two-night-only event will change the way you think about Valentine's Day forever that is, if you escape the rampaging Cupid and make it out with hearts intact. Q: Holiday-themed? But is it scary? A: We ALWAYS aim to make you scream! You won't find any cute and cuddly teddy bears or edible candy here. A: Will be decided soon. Please note, that with these added accommodations, there will be absolutely no refunds, even if you cannot make it. A: . You can purchase tickets at www.frighthaven.ticketleap.com. Tickets are being sold in limited quantities per night, per time slot, so we encourage you to buy your tickets in advance. Q: Is there an age limit? Will I be touched? A: There is no age limit and you will not be touched. We, as always, generally recommend attendees be 13 years of age or older - but we won't turn away any brave little ones, at parents' discretion. Q: Is the attraction indoors? Will I be warm? A: Yes, we are an entirely indoor attraction. We have increased the size of our indoor queue line to refrain from having attendees wait outside. A: We will be making annoucements soon. If you have any additional questions about Fright Haven, or about the Haunted Tours of Transylvania that we produce (see www.DRACtours.com and www.GHOSTour.com), phone (203) 799-FEAR or Email us FrightHaven@aol.com.